Creating custom paint designs for a car is an inexpensive way for a car enthusiast to express creativity. One of the best parts about creating custom paint designs is that they can all be done on paper and laid out in front of you. This allows you to choose your favorite custom paint design without going through the expensive and time-consuming hassle of trying out your ideas on the actual car itself. Compelling paint schemes have a strong theme and bold color choices, such as flame red with poker spades. Decide on what type of car you want to make the design for. The example used here is a Cadillac, but any car will do. 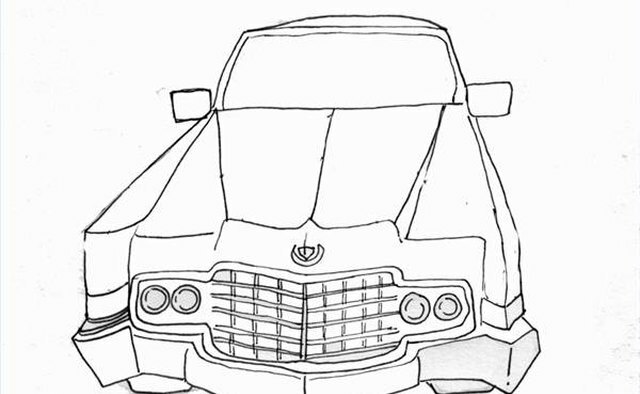 Draw the car out on paper. The details do not have to be exact. 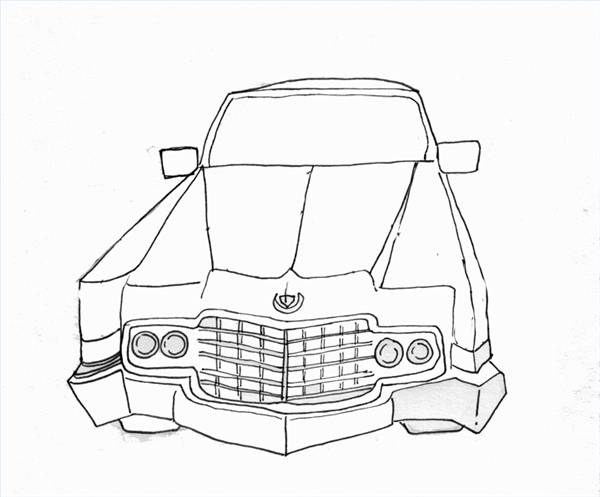 Simply draw a rectangle for the front grill section of the car. Attach two diagonal lines to the upper left and right sides of this shape to create the hood of the car. Add a horizontal line at the top of the diagonal lines to create the bottom of the front window. Add short diagonal lines to the left and right side of the horizontal line to create the sides of the front window. Draw a slightly curved horizontal line connecting the two diagonal lines to form the roof of the car. Flesh out the details on the frame of the car. Add small rectangles to the bottom left and right sides of the front window to create the side view mirrors. Create the head lights with a pair of small circles, side by side, at the right and left sides of the front of the car. Add the bumper with a curved rectangle shape attached to the front bottom of the car. 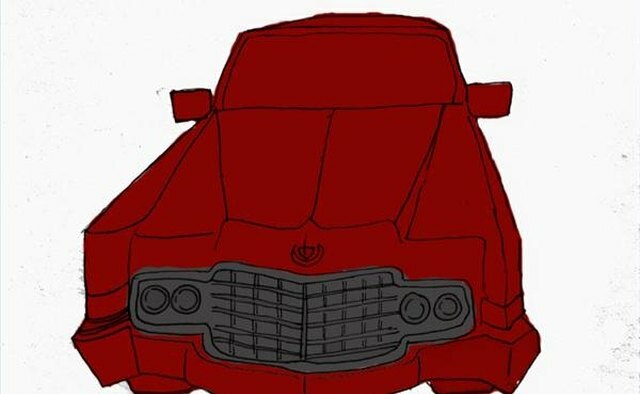 Create the grill itself with a square shape in the center of the front of the car. Draw five horizontal lines across the square and eight vertical lines running down the square to create the effect of the grill. Add a base color to the car. Color the entire car red except the grill, which should be gray. Once the ink has dried, add highlights and designs to the base color. Color the front window black or dark gray and the bumper light gray. Add some flair to the paint design. Do this by adding orange and yellow highlights. This will enhance the look of the red paint, and the variations in color will prevent your design from looking stagnate. 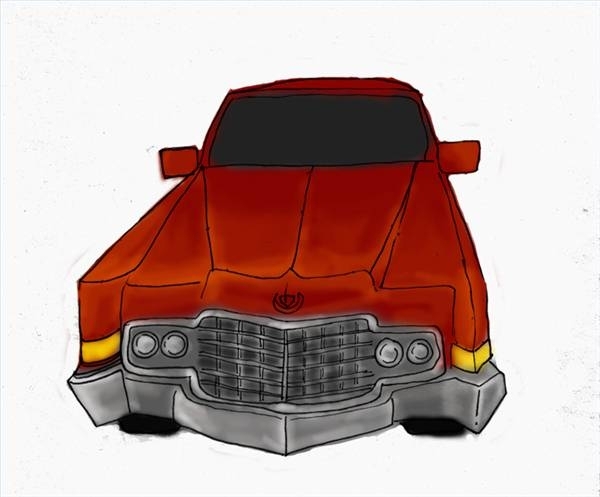 Using an orange colored pencil, add highlights to the top front of the car and the front right and left sides. Add more color with harder strokes near the front and gradually ease up on your pencil as you go further down the car. Add a thin line of yellow to the center of these highlights to really punch up the color design. Draw a spade in the center of the hood as the main focus of your design. Do this with two diagonal lines that start at the center of the hood just below the front window. These lines should slowly spread apart form one another and then curve back towards each other. Add a U shape to the base of the spade to complete frame of the design. Add two smaller aces on the side view mirrors of the car. Do this the same way you did the hood but make the lines much smaller. Place these spades in the very center of each side view mirror. Color the spades in with black marker. Be careful around the edges of the spade to not let the marker bleed past the guidelines you have drawn. Sand the old paint on your car with 500 grit sand paper. Scuff the paint on the car so a new coat will stick. Place garbage bags secured with painter's tape around any areas you do not want painted such as the windows, grill and tires. Spray the body of the car with one coat of white automotive primer. Let this dry overnight and gently sand the surface. Spray the the body with at least four coats of deep red. Make sure that you sand in between each coat. Add the orange highlights by starting in the front corners and spraying to close to the corner and moving back further away as you go up the car to create a fading effect. Add yellow highlights with a very small line of spray in the center of the orange. 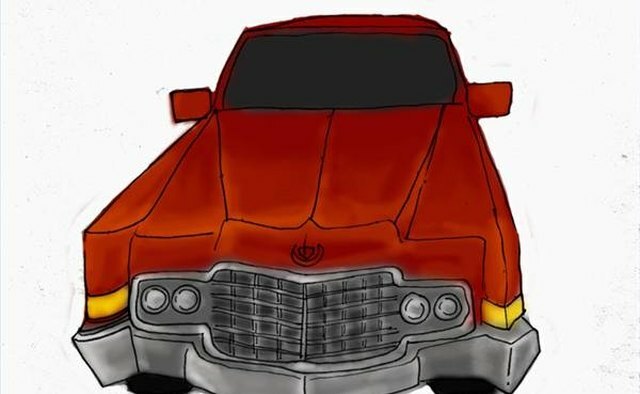 Mark out the spades on the hood and side view mirrors with a soft graphite pencil. Place painter's tape around these shapes to ensure that no paint spills over on the rest of the car. Carefully spray black high gloss enamel on inside the patterns. Let the paint dry and remove the painter's tape very slowly. Let the paint dry overnight and spray the entire body of the car with three coats of high gloss enamel automotive paint. Carefully remove the tape. Spades are just one custom paint design you can create for a car. 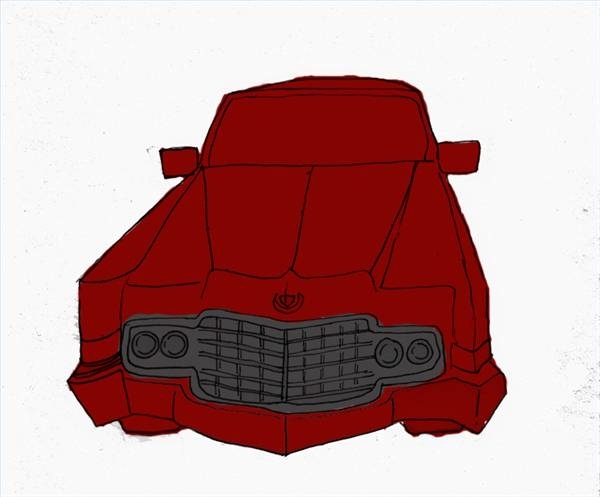 Make a photocopy of the blank car design in step 2 and try design elements such as diamonds, hearts, clubs or even the joker. Take the designs to an automotive paint professional as an alternative. This may cost more but the painter can walk you through how they will bring your design to life and make sure that you are happy with the results. Be sure to place a piece of paper under the design so that the ink doesn't bleed through. Let your design markers dry thoroughly before using colored pencil for highlights or you could smudge or tear your design.